Click here for time schedule! Click here for more information on routes! 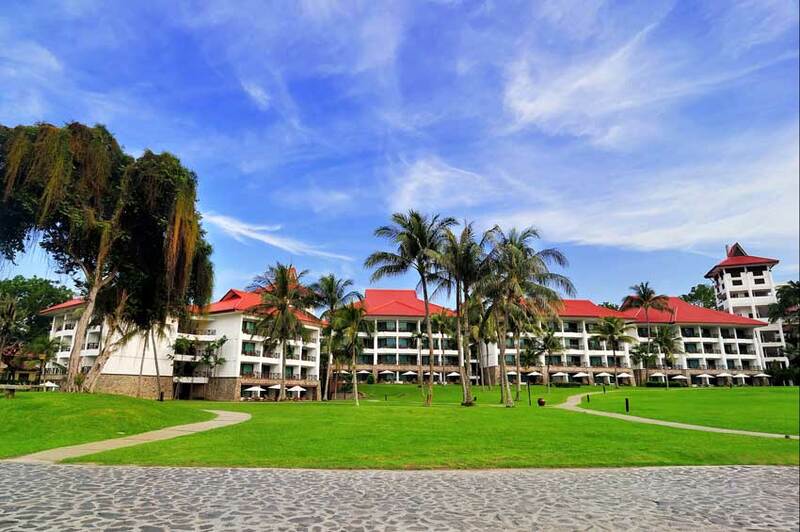 Perched on the magnificent Pasir Panjang Beach, overlooking the majestic South China Sea, Bintan Lagoon Resort is the tropical paradise, home to sun, sea, sand and two spectacular golf courses. 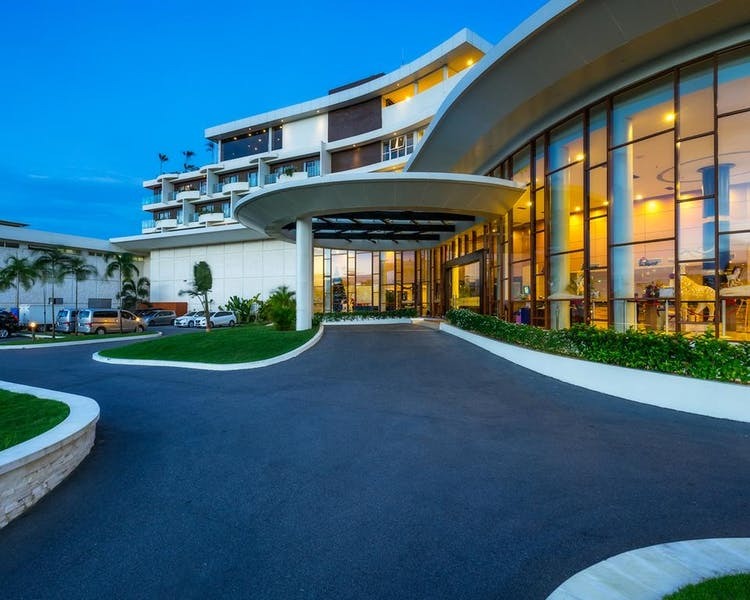 Bintan Lagoon Resort (BLR) is a tropical lifestyle destination that offers a medley of unforgettable experiences for leisure, golf and MICE groups. Sprawled over 300 hectare of beachfront gardens, BLR is a 75-minute ferry ride away from Singapore. The resort boasts 450 contemporary rooms, suites and villas to suit couples, families and groups alike. Each well-appointed room and suite features a furnished balcony, in-room amenities and modern conveniences. 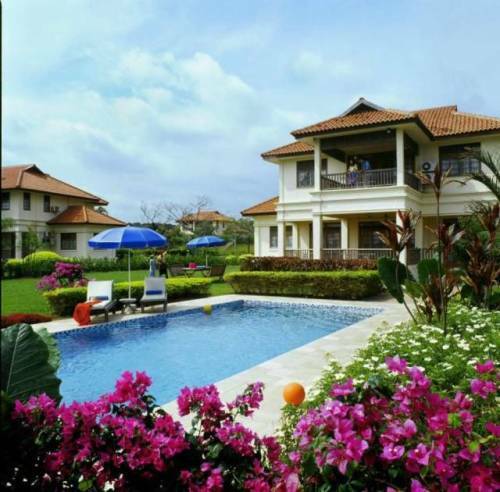 Ideal for corporate groups, multi-generational families and friends desiring their own privacy, the resort's 57 villas, ranging from three to four-bedroom configurations, offer accommodation in a more casual setting. These self-catering villas are equipped with kitchenettes, barbecue areas, generous living areas and a personal buggy to get around the resort. For bigger groups, the 4-bedroom Angsoka Villas comes with the added indulgence of a private pool. 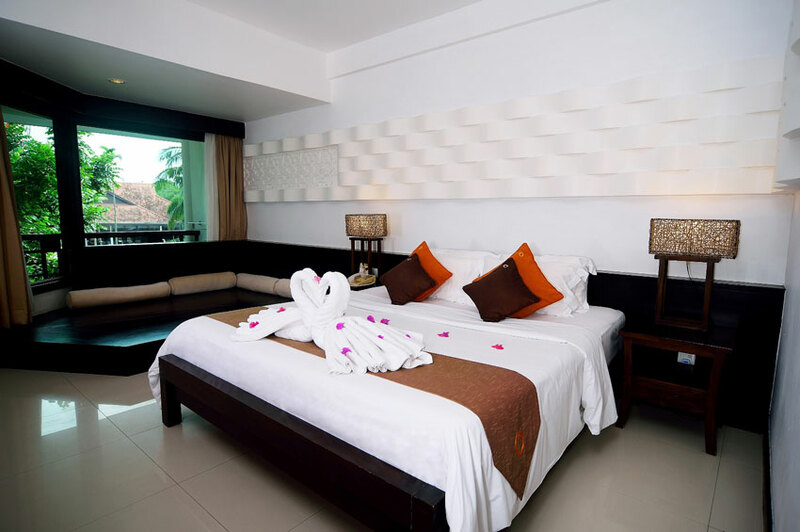 Deluxe Room (37 Sqm) – nestled amongst lush tropical foliage, fragrant with blooming flowers and tall swaying trees. Deluxe Rooms are an oasis of peace and tranquillity. Nirwana Resort Hotel has 241 guestrooms including 30 suites, all with a sweeping sea, pool or garden views. Full modern amenities and facilities are available to guests, and our ensemble of restaurants and bars will satisfy the most discerning taste buds. With a full and comprehensive range of activities lined up for guests, diverse interests and pursuits are matched with top quality facilities and services. Our unique blend of sunny Mediterranean spirit and warm Indonesian hospitality will make you feel more than welcomed here. In fact, with something to do for everyone in the family, you are assured of a great time in this sunny, cheery paradise! The Nirwana Rooms category takes inspiration from the resort’s theme of natural elements and warm colours. The rooms are accentuated with the use of wooden furnishings and soothing shades of colours, and a beautiful hand-carved plant motif as a highlighted centrepiece. Cosy yet comfortably spacious at 31sqm and fitted with Queen or Twin beds, the garden-facing Nirwana Rooms are suitable for travelers seeking a beach resort getaway with the comfort of modern amenities and great value. The rooms come with modern, fully equipped en-suite bathrooms fitted with bathtubs. Featuring the most breathtaking settings ranging from seaside pavilions to lush garden terraces, the privacy and tranquillity of Angsana Bintan promises an idyllic holiday filled with sensory pleasures. Made for pleasure and relaxation, each room features colour TV with multiple cable channels, air-conditioning, mini-bar, private shower and bath, personal safe, hairdryer and coffee- and tea-making facilities. The suites offer spacious and separate dining and living areas. Superior Room (33 Sqm) – Boasting spectacular balcony views, the Superior Room provides a cosy getaway for those escaping the hectic city life. Deluxe Room (33-41 Sqm) – The Deluxe Room, with its own balcony, will pleasantly surprise you with the spacious interior and breathtaking views of the sea, swimming pool or lush gardens. You can choose to have a queen-sized bed or two single beds. One-Bedroom Suite (76 Sqm) – Tastefully furnished, the One-Bedroom Suite features separate living and dining areas. It comes with a pantry, and a balcony in both the living room and bedroom. Angsana Suite (275 Sqm) – Ideal for families, the Angsana Suite offers a pantry, large dining and living area and two tastefully furnished bedrooms. The Angsana Suite also boasts a spacious, private sundeck with an outdoor shower, an outdoor jet pool and a large, private landscaped garden. 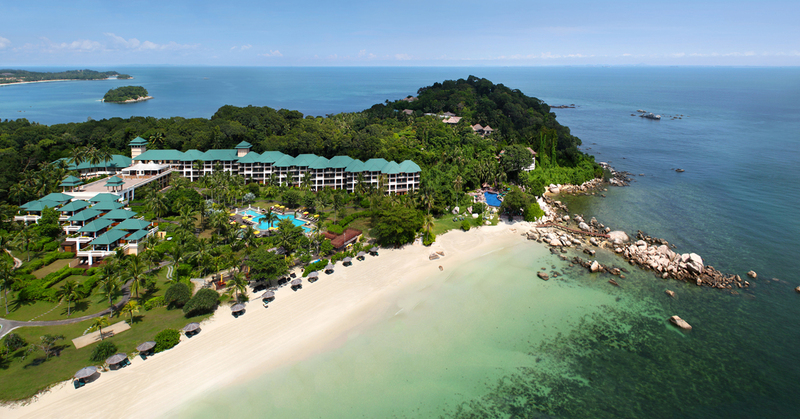 Have a blast at Cassia Bintan's beachfront living by the South China Sea. Be served by our friendly crew or whip up your own delish meals in the serviced apartments' chef-perfect kitchens. Chill and hang out with other guests at the trendy beach club. 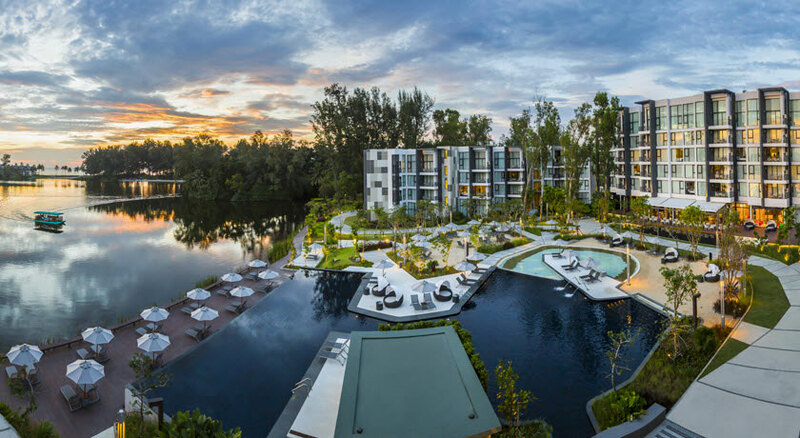 Cassia Bintan is the newest addition to the exclusive Laguna Bintan Integrated Resort, which houses a suite of facilities including indulgent spas and an 18-hole golf course. Welcome to Cassia Bintan. Mayang, in the local language, means blossoms of the palm, while Sari is the essence of the flower. Together, Mayang Sari Beach Resort captures natural beauty in its essence and fragrance. Leave the world behind as you cruise to Mayang Sari Beach Resort Bintan – a rustic resort tucked away in a pretty little cove on Bintan Island. Set in unspoiled nature on the northern coast of Bintan Island, Mayang Sari Beach Resort offers the perfect haven for a brief respite or a long weekend. Wake up to the fresh sea breeze and the lush beauty of a tropical beach. 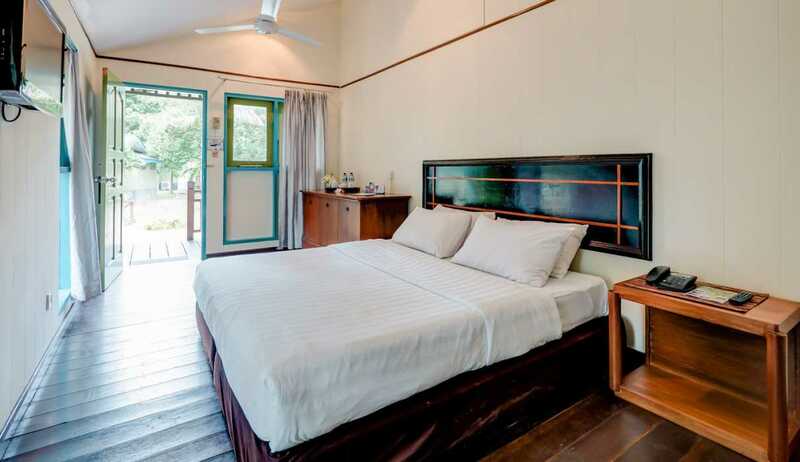 Each air-conditioned chalet is equipped with modern amenities and also has an attached bathroom and a private veranda that commands either a garden or sea view.  * Promotion packages and hot deals may not be entitled to full amenities and services as listed. 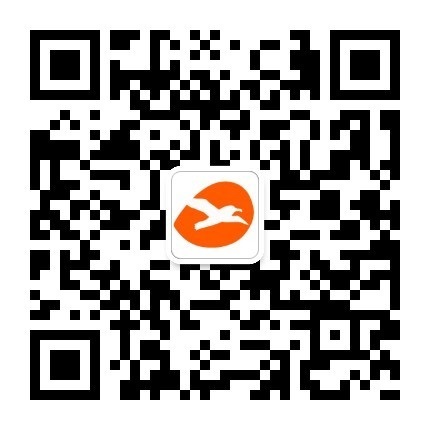 Please refer to package details upon confirming your reservation. * Other terms and conditions apply. Grand Lagoi Hotel by Nirwana Gardens is a 132-room 4-star hotel located at the heart of Lagoi Bay in Bintan Island, Indonesia. The hotel occupies a prime position on the Northern part of the island and is the perfect destination to experience the rustic and quaint side of Bintan - only 3 minutes' walk away from Lagoi Beach. 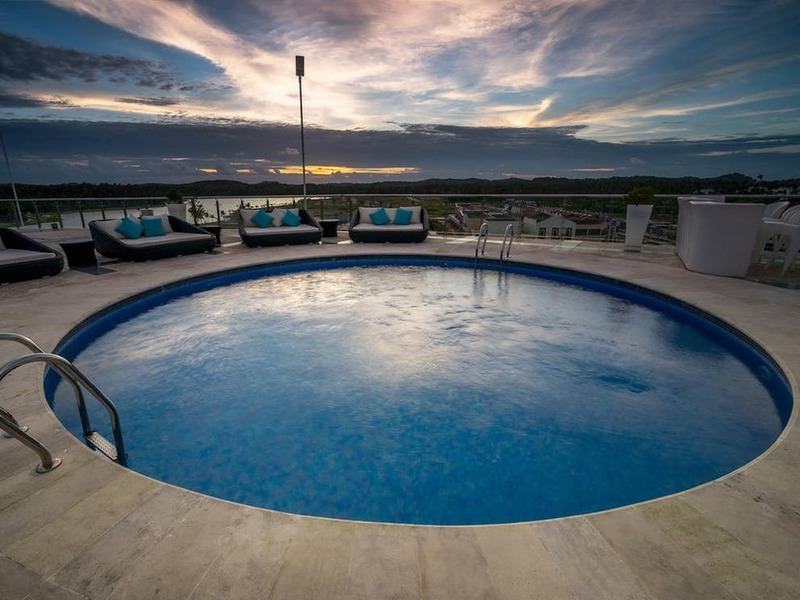 The hotel offers a range of facilities and services including a spectacular rooftop infinity pool commanding panoramic views and two contemporary restaurants where guests can embark on a culinary journey. The cosmopolitan chic setting offers guests a delicious meal amidst fantastic views of Lagoi Bay Lake. Furthermore, Grand Lagoi Hotel is strategically located next to Plaza Lagoi and Lantern Park. Each room is well-equipped with a 42-inch flat-screen TV with international satellite channels, in-room safety deposit box, individually controlled air conditioning, mini bar fridge, coffee and tea making facilities, hairdryer, bathrobes, IDD telephones and free Wi-Fi access. Our Front Desk is at your service 24 hours a day along with the hotel's team of charming and most helpful employees offering an exceptional standard of customer care. Daily laundry and dry cleaning services are available on-site and handled with the utmost care at a reasonable rate. Guests are welcomed to check out our range of facilities and services such as the fitness studio, gift shop, kids' club, function rooms, concierge and more. Deluxe Room (37 Sqm) - Comes with ensuite bathroom, air-conditioning, Wi-Fi and cable TV. Complimentary use of the Games & Entertainment Room as well. Grand Deluxe Room (47 Sqm) - Enjoy the complimentary use of the Games & Entertainment Room, Wi-Fi and a welcome drink. The room comes with ensuite bathroom, air-conditioning, and cable TV. 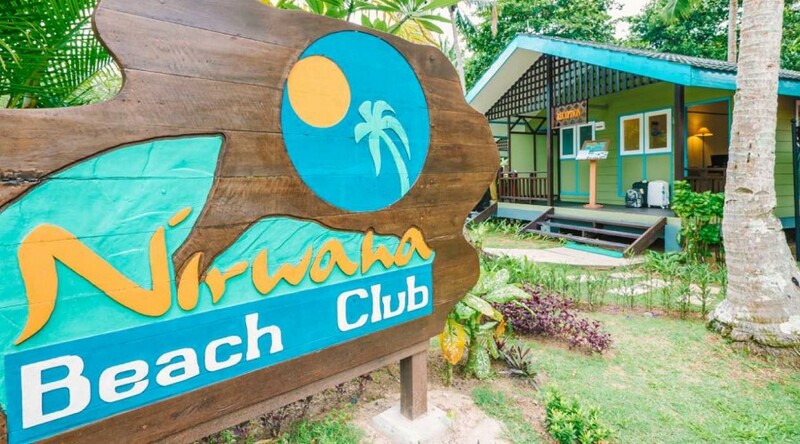 With the recent upgrading of the Nirwana Beach Club, guests will be struck by the new contemporary cosy rooms complete with new furnishings, amenities set on wooden flooring in the exquisitely renovated rooms. Different colours on the exterior set in Indonesian concept parallel with the new landscaping design superbly. Each cabana is air-conditioned for the comfort of our guests, and selected Cabanas are equipped with a private verandah for guests to lounge in the afternoon sun. Bathroom includes a standing shower with soap and shower gel provided. The Cabana Rooms come with garden views, complete with en-suite bathrooms in a cozy space of 19 sqm. Signup to receive latest promotions!